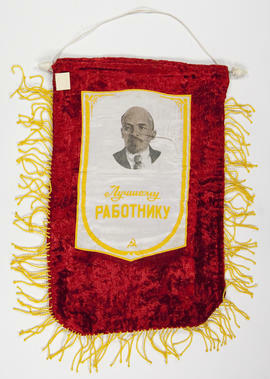 Woven rug of Vladimir Illyich Lenin wearing a hat. The rug is woven in shades of blue, brown, grey and red with white tassels. Woven rug of Vladimir Illyich Lenin's profile in brown, beige, black and white. Writing on verso. Pieces of white paper adhered to verso. Small card posters printed with a photographic image of Lenin outdoors wearing the beret-like cap in which he was often seen. 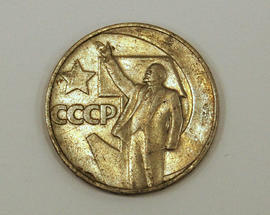 "V. I. Lenin" is written beneath the photographs. The posters were produced in Moscow. Small card posters printed with a photographic image of Lenin seated outdoors on a Gorky Park bench. 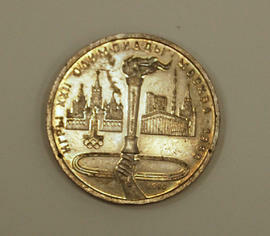 Original photograph dates to 1922 and was produced in Moscow. Beneath the photograph it reads: V. I. Lenin in Gorky Park, 1922. 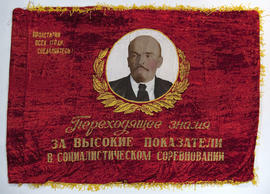 1, 2 piece poster, depicts full body portrait of Lenin with his name in red. 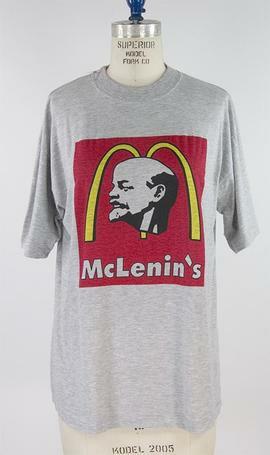 Item is 4 posters depicting adult Lenin on the background, and Lenin as a young Pioneer in front. Pioneers were pre-Comsomol members aged 10-14 years. There is a slogan written in blue. 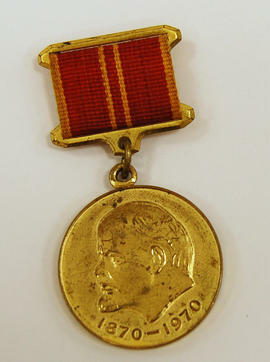 Item consists of 5 unmounted posters depicting several smaller vignettes of communist subject matter, including Images of Lenin, soldiers and communist symbols. Fourteen loosely rolled posters depicting Lenin's portrait. Various images. Item consists of 4 unmounted posters depicting Lenin surrounded by twelve different photographs of Lenin representing various events of his political life. 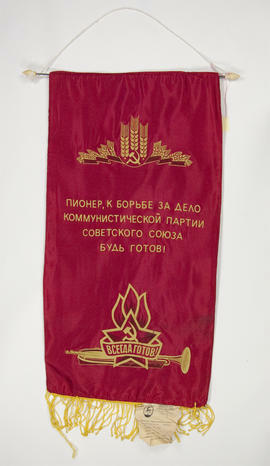 Item consists of 2 posters depicting the image of Vladimir Illyich Lenin surrounded by various Soviet republic crests. Nine loosely rolled posters, 3 copies of a 3-part poster. 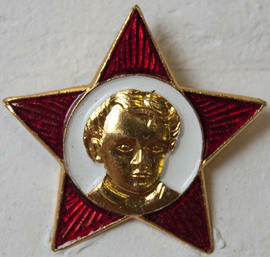 Poster has a painted version of Lenin's portrait on handwriting background in gold. 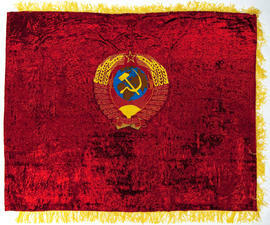 Item consists of 3 unmounted posters depicting red and white graphic image of Lenin against a red blackground. There is white text on the left side of the poster. 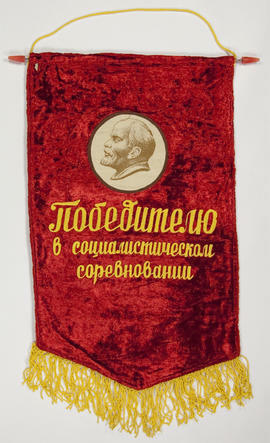 Item consists of four unmounted posters depicting a portrait of Lenin on left side, with a text background. The right side has been left blank for something to be written or glued on. 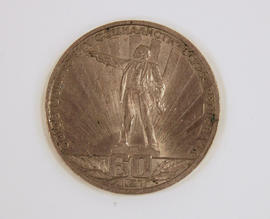 Item is 5 umounted posters with a black and white photograph portrait of Lenin. Three posters also have a red border and a slogan in left top corner of the poster.